Peugeot has revealed pictures of its new 208 GTi Concept, ahead of an official unveiling at the Geneva Motor Show next month. 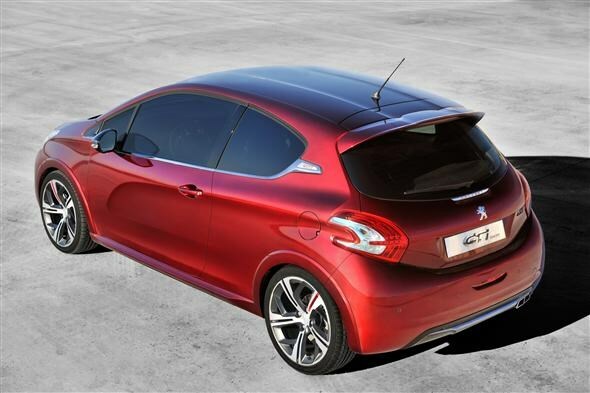 The go-faster version of the 208, which is due to go on sale in the UK in Spring, revitalises the tradition of the GTi – the most famous being the 1980s Peugeot 205 GTi. 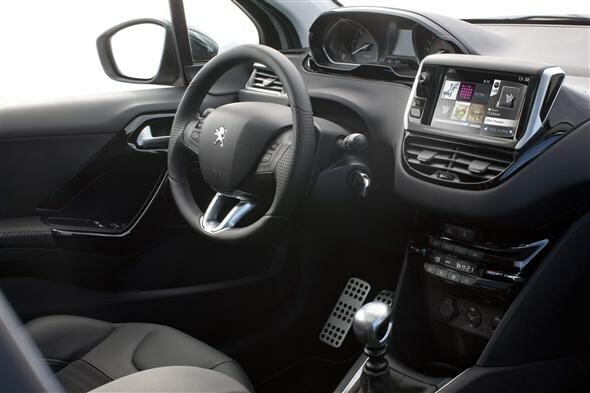 It features plenty of detailing to let you know that you are driving no ordinary 208. Chequered-flag motifs embellish the metal mesh of the grille, and the lower bar will display the French ‘Tricolour’ flag in France or the Union Jack when in the UK. Other distinctive exterior features include double-chromed exhaust tailpipes, lower bodywork spoilers and lower sill skirt extensions. Placed within the grille is the brushed aluminium GTi Concept logo that can also be found on the rear quarter panels as a salute to the 205 GTi. On the inside there’s a leather stitched sports steering wheel and gear lever, with double stitching in the seats. The sports seats are trimmed with Nappa leather on the outer section, and cloth in the centre with an embossed tartan motif. There's even a leather head restraint. The red perforated leather steering wheel has a lower flat section, which carries the GTi Concept logo set in an aluminium ring. To complete the sports interior, the fascia capping is dressed in Alcantara with grey stitching, the roof lining is entirely black and the pedals are aluminium. The centre console architecture and ventilation vents all feature a graduated red to black effect, and the chequered-flag theme is also present on the aluminium door crossbars. It will be powered by a 198bhp 1.6-litre petrol mated to a six-speed manual gearbox. To enhance the handling Peugeot has widened the track on the 208 by 36mm and a rear roof spoiler has been fitted to generate more downforce. To help slow the hot hatch, disc brakes are fitted all around. There are 302mm diameter discs at the front, and 249mm discs at the rear, and all four feature red-painted brake calipers. Wheel arches have wing extensions, and bodywork with sills to enhance the stance. The French company will also be revealing its XY Concept urban city car. It's powered by a 1.6-litre e-HDi engine mated to six-speed gearbox, with a total power output of 115bhp. 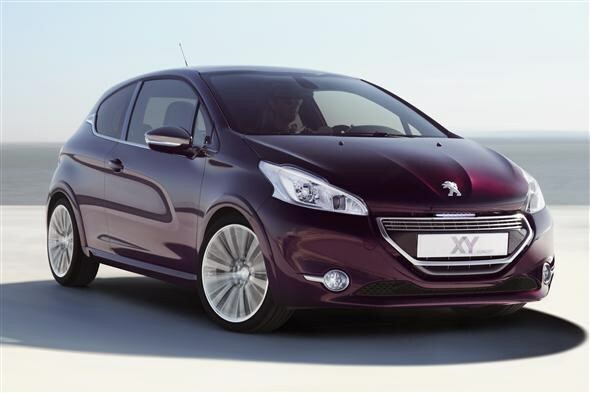 The major feature on the car is the so-called ‘pulsion’ paintwork, which means the XY Concept appears to constantly change colour depending on the distance and the position from which it is viewed. This ability to transform is the result of an exclusive method, based the application of 16 coats of paint and lacquer. The passenger compartment is trimmed with crimson stitched leather on the dashboard, armrests, steering wheel rings, gear lever gaiter, and features stripes on the seat inserts and floor mats. The panoramic glass roof is edge-trimmed in black leather. It also features dual-effect 18-inch alloy wheels complementing its unique paintwork. The lower window edge and the quarter panel are finished off with a special grille treatment with three horizontal chrome bars. 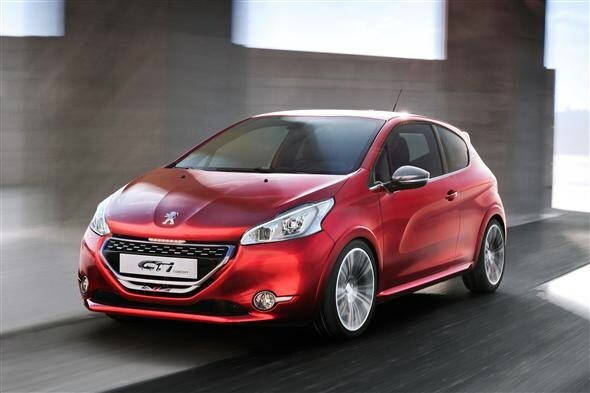 The Peugeot 208 GTi Concept and XY Concept will be revealed in full at the 2012 Geneva Motor Show, which Parkers will be covering live.